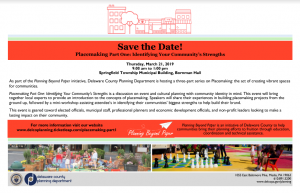 The Delaware County Planning Department would like to formally invite you to the first of three of workshops on Placemaking titled Placemaking Part One: Identifying Your Community’s’ Strengths to be held at 9:00 am on Thursday March 21st, 2019, at the Springfield Township Municipal Building. It is geared towards municipal planners, leaders, elected officials, and the movers-and-shakers of your community. Are you looking to energize your town? Placemaking Part One brings together speakers from across the region to share their experiences in creating placemaking projects from the ground up and to express the impact such projects have made on local communities. Following the presentations, local placemaking experts will lead a hands-on workshop to help communities identify their strengths to help build their brand. The event will conclude with a light networking lunch which will allow community leaders to further collaborate and ask more questions about placemaking.